Airline passengers crowding around the gate, waiting for their group to be called, has plagued the flight boarding process for a long time. But United Airlines believes its new, simplified approach to boarding will help alleviate the problem. (NEW YORK) — Airline passengers crowding around the gate, waiting for their group to be called, has plagued the flight boarding process for a long time. But United Airlines believes its new, simplified approach to boarding will help alleviate the problem. The idea began about a year ago when an increasing number of customers complained about time spent standing in line and congested boarding areas, United’s Maria Walter, managing director of global operations strategy, told ABC News. “We didn’t want people to feel stress or anxiety before they board,” Walter said, adding that customers getting off the previous flight and passengers with disabilities were especially affected by people swarming the gate. So United scrapped the airline’s previous method of diverting passengers into five separate lines before boarding. It will continue to have several different groups of passengers, but the number of lines that those passengers wait in will be reduced to two, decreasing the time that people will stand in line before their group is called to board. While one group boards, the group boarding next will be asked to line up. All other groups will be asked to remain seated. United claims the two-line system will free up space around the gate, and reduce time spent standing in line. The airline hopes that people in later groups, such as 4 or 5, may spend about 30 minutes less time standing in line during the new process, Walter told ABC News. 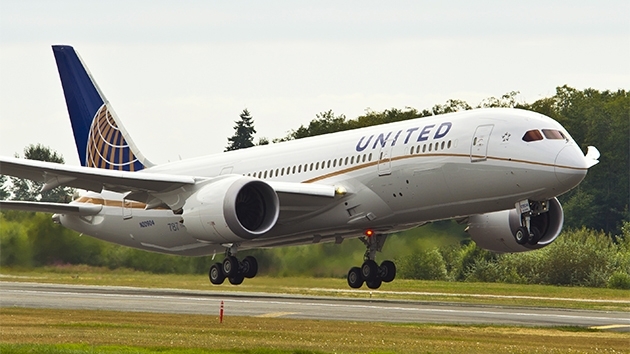 United first tested the new system earlier this year with select flights out of certain airports including LAX, Chicago O’Hare, and George Bush Intercontinental Airport in Houston. Like other carriers, the first people to board on United flights are disabled passengers, active military, families with young children, and those who have a high status within the airline. Following that “preboarding” group is Group 1, made up of first and business class passengers. Group 2 includes United credit card holders, passengers with moderate status within the airline, and anyone who purchased priority boarding. Groups 3 and 4 are Economy customers. Basic Economy customers board last. The airline says the time it takes to board the entire plane isn’t necessarily reduced under the new method. Instead, the new system is designed to simply cut down on time that passengers have to stand in line. This latest adjustment from United reflects an ever-changing landscape of airline boarding processes. American and Delta changed their boarding process last year, and Southwest changed their boarding process in 2007. But none of these changes have eliminated people’s habit of hovering around the gate before their group is called. Reducing overall boarding time has long been a struggle for the airline industry. The various levels of passenger status and more passengers with carry-on bags are among the many reasons boarding is slower now than it has been in previous decades. Low-cost airlines, such as Spirit, claim faster boarding times because of additional fees on carry-ons that deter customers from bringing bags on board. More customers spending time pushing suitcases into the overhead bins means delays for passengers getting into their seats. Airlines will continue to work on improving the boarding process, but until they do away with things like carry-on luggage allowances, frequent flyer statuses, and small overhead bins, it’s impossible to create a perfect process.